Kelley Supply's staff members began working in palletizing in the early 1980's. Today, we specialize in the food industry throughout North America. Our experienced staff members have designed and built all types of palletizers for almost all types of systems for most types of packages. We have built and installed palletizers and palletizing-related systems in over 40 states and 5 countries. Our staff have implemented and/or serviced Fanuc, ABB, Nachi, Yaskawa (Motoman), Okura, Fuji, Denso and other brands of robots. We are not obligated to sell any particular brand of robot, so you can rest assured that you will get an objective look from a business partner, not an integrator looking to promote any particular brand. Palletizing bags of whey in Iowa, New York and Wisconsin using a robotic bag palletizer. Palletizing bags of sugar in North Dakota using robotic bag palletizer. Palletizing bags of yeast in Wisconsin using a robotic bag palletizer. Palletizing bags of seed in South Dakota using robotic bag palletizer. Palletizing bags of feed in Wisconsin using a robotic bag palletizer. Palletizing bags of cornstarch in Iowa using a conventional bag palletizer. Palletizing nutraceutical powders for a Minnesota company with a robotic palletizer. Palletizing cases of cheese in Wisconsin using a robotic case palletizer. Palletizing pasta in Minnesota using a robotic case palletizer. Palletizing cases of chemicals in Minnesota with a robotic palletizer. Palletizing cases of frozen dinners in Illinois using a robotic palletizer. Conventional low level, high level, and robotic palletizing cases of cheese in Wisconsin, IL, MN, OH. Robotic palletizing cases of frozen fruit/veggies in Wisconsin. Robotic case palletizing frozen bread dough in WI. High-level conventional and robotic case palletizing frozen bread dough in Idaho, Texas, and WI. Palletizing plastic dairy cases in California, Oregon, Arizona, Pennsylvania, Wisconsin, etc. Conventional low level, high level, and robot palletizing cases of frozen fruit/veggies in Wisconsin. Palletizing jars of pickles in Arkansas, Michigan and Wisconsin. Palletizing cases of snack food in Minnesota,Pennsylvania, and Wisconsin. Conventional low level and high level palletizing cases of canned veggies in Minnesota, WI, etc. Palletizing cases of seed in Missouri using conventional palletizers. Palletizing cases of water in Wisconsin using conventional palletizers. Palletizing cases of paper in Wisconsin and Kentucky using conventional low level palletizers. Palletizing cases of salad dressing in Wisconsin using conventional high-level palletizers. Palletizing plastics in Wisconsin using hybrid palletizers. Cases of oil in California. Contact Us Today about your Robotic Bag Palletizer project! Distributors of stretch wrappers, bag conveyors, bag sealers, bag flatteners, etc. Packaging supplies professionals for barrier film, stretch film, shrink film, etc. Our robotic bag palletizer integration assembly department. With over thirtyyears of palletizing experience with nearly every make and style of conventional palletizers, gantries, robots, package and pallet conveyor, stretch wrappers, pallet and sheet dispensers, vision systems, and controls integration, we are able to speak to the issues of your project concisely and clearly. Our supplier partners include only the finest robot manufacturers in the world, including Fanuc, Nachi, ABB, Yaskawa, and Kuka. Our integration services are positioned to primarily serve the North American geographic market, although equipment has been placed globally through channel partners. 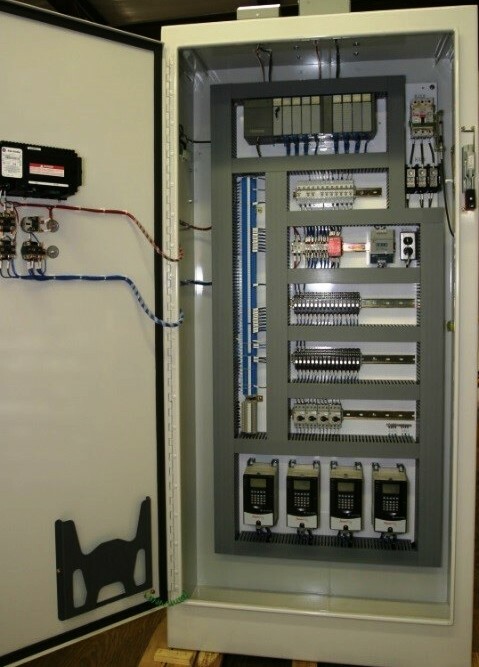 UL508 panel shop and full machine shop capability.